Have you ever given a thought to your Halloween-related consumption and just how much waste this holiday generates? 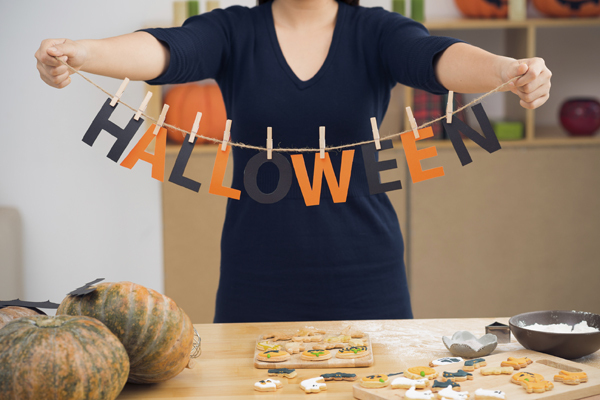 Learn more about how to make your Halloween an eco-friendly one! – It goes without saying, reusing the same decorations every year is an excellent practice! – When making decorations, try using cardboard boxes and old sheets, and add your own personal touch. – Looking for a fun activity to do with family or friends? Decorate a pumpkin! Get creative and let your imagination go! Try to buy your pumpkin from a local famer and, if possible, buy organic. – If you decide to carve it, collect the seeds and roast them, and use the flesh to make soup, cake or a pie! – If you opt to make a jack-o-lantern, light it up with a beeswax candle, which is much more eco-friendly than a petroleum-based wax candle. And of course, don’t forget to compost your pumpkin when all the fun is over! Renting a costume or making one from clothing that you already have is not only economical, it’s ecological! Other alternatives include exchanging costumes with friends, shopping at second-hand stores, or checking out online classifieds websites. – Going out trick-or-treating? Walk, don’t drive! It’s a good excuse to get some fresh air and a great way to minimize your ecological footprint! – Collect candy in a reusable bag, rather than a disposable one. – Most Halloween candy is individually wrapped. Recycle what you can, and collect and send the chocolate wrappers to the organization TerraCycle. The wrappers will be upcylced into fun and innovative products! What about you? What will you do to green up your Halloween this year?